Nowadays we are suffering an economic crisis and one of the fields that is noticing this a lot is the scientific research. National and regional governments are cutting their budgets and some of the biggest cuts are in science. We, researchers, are having a very hard time to do our research and people in general doesn't like these cuts in science. Well, there is a way for all of us to make a contribution in order to alleviate this money problem in research, or at least to help funding some interesting and useful projects. It's called SciFund challenge and it's an experiment of crowd funding. Several scientists will present their projects in a creative way to get funding from people for those projects. Everybody will be able to fund several research projects through small donations and help these scientists and their groups to do their research. 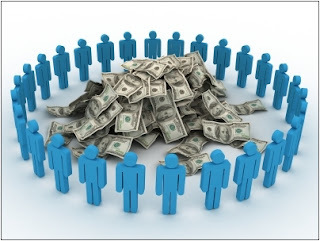 Crowd funding has been used traditionally in the fields of journalism, music or film making, but it has been used lately in science communication as well. Two different examples (in Spanish) are the Amazings magazine funded thanks to people collaboration and interest, and the Taracea platform from the Spanish Foundation for Science and Technology (FECYT) to give people the possibility of funding science communication and public engagement activities through donations. Until now crowd funding hasn't been used to get funds by the scientists themselves for their projects. However, a similar system has been used to raise money for charities. In UK many people do marathons, or long walks, or something that requires an effort to be sponsored by their friends and family and donate the money they get to the charity they choose. A clear example is Cancer Research UK (CRUK). This organisation is basically funded by personal donations and is one of the organisations that fund cancer research in UK (actually they pay my salary and most of the stuff we use in the lab). In Spain a new foundation (similar to a British charity) has been establish recently following the spirit of CRUK. It's called Fundación Vencer el Cáncer and one of its aims is to fund cancer research done in Spain with personal donations from people. But the originality of the SciFund challenge is that the scientists themselves are the ones presenting their projects in an interesting and understandable way for the people to choose those that they want to fund with their donations. So far 146 scientists from all around the world have signed up to be part of this experiment and I am one of them. The deadline to participate is the 1st of October so, if you are a scientist and want to raise money for your projects, you are still on time to sign up. All of us, the scientists, will have to prepare a campaign to give the information about our projects and they will be hosted in one of the most important platforms of crowd funding in internet: RocketHub. This is another way of doing public engagement and science communication, although all scientists should communicate their science, even if it is not to get funding. I think the SciFund challenge is a new initiative in which society will be able to get involved in science funding and even more, in funding the science that they like, understand or think it is more useful. It's a different and new way of involving people in research, of making them realise that they are very important in research. That, at the end, scientists depend on the society willingness to commit with the advance of the knowledge through research.